At-Home CDI: A Remote Possibility or Something More? Kaiser Permanente has employed it to great success, but critics question its viability at other organizations. • Review outstanding electronic queries. • Finalize all discharged cases electronically. • Review 20 to 28 charts electronically per day. • If queries are necessary, use electronic notes, e-mail, texting, and phone calls to communicate with physicians for clarification. Fore, who works for Kaiser Permanente’s northern California region, completes these tasks from an ergonomically approved home office where she has a dual computer screen and a secure virtual private network connection to Kaiser Permanente. Sometimes she works in fuzzy slippers and pajamas with her dog seated comfortably on her lap. Wait, a clinical documentation improvement (CDI) specialist who works from home? How could this possibly be effective, given the importance of building interpersonal relationships with physicians? It’s not only effective, but both CDI staff and physicians alike have responded positively to the program that continues to grow and thrive, says Michelle L. Callahan, RN, BSN, CCDS, CRCR, regional manager of clinical documentation integrity at Kaiser Permanente. The remote CDI program at Kaiser Permanente currently includes 28 full-time CDI senior consultants who, like Fore, spend much of their time querying and following up with physicians at each of the system’s 21 facilities. Patient volume determines the number of consultants assigned to each facility. Seven full-time CDI consultant quality analysts who are former coders also work from home to validate the consultants’ work. Kaiser Permanente hadn’t always envisioned a remote CDI program. In fact, the organization initially performed an on-site CDI pilot at one facility in 2009 with the intention of rolling it out at other facilities shortly thereafter. Fore, who previously worked at a smaller medical center in California as the senior director of care coordination, was hired to help lead the effort as a regional manager and served as the interim regional director in August 2010. However, by late 2010—and well before an on-site organizationwide CDI program was ever fully deployed—Kaiser Permanente was headed in a different direction. “We made the determination that with the amount of growth we were going to need to do and how difficult it was to get real estate, we probably would have a difficult time maintaining [CDI specialists] at the facilities. We were looking for something new, innovative, and creative that would be as effective as the traditional in-facility CDI models,” says Callahan, who joined the CDI team just as the organization began to consider a completely remote option. Saving money was also a driving force behind designing a purely remote program. Although Kaiser Permanente never formally calculated how much the remote program would save in terms of on-site costs and overhead, it was likely a significant amount, says Callahan. “For Kaiser Permanente, it was also in line with the view of being the green way to work with fewer people on the road, etc,” she says. Robert S. Gold, MD, CEO of DCBA, Inc, says although it may be tempting for hospitals to implement remote CDI programs as they migrate toward EHRs, it’s important to remember that these programs tend to lack one crucial element: personal contact. Face-to-face contact and interpersonal relationships—which comprise the foundation on which successful CDI programs are built—are “totally lost with remote CDI” because CDI specialists are “out of sight and out of mind,” he says. Very few of the hospitals in which Gold consults have implemented CDI programs where specialists work either part or full time from a remote location. He says remote CDI is generally unsuccessful in the long run due to communication barriers with physicians, although it may be a short-term solution to handle staffing shortages or provide 24/7 coverage. It may also be viable in the outpatient arena where CDI specialists can perform remote prebill reviews of professional claims that would better accommodate physicians’ busy schedules. “The most successful CDI programs in the country are those that are run by and include intimate relationships with the medical staff and include all patients treated by the medical staff so that the medical staff feel that they are the leaders of quality in the hospital,” Gold says. Even programs that begin on site before going remote will struggle to maintain open lines of communication between CDI specialists and physicians, Gold cautions. One hospital for which he provided CDI consulting services struggled with transitioning from a fully on-site CDI program to one in which specialists reviewed charts remotely. The move to a remote CDI program caused a rapid decline in physician response rate, he says. “[CDI specialists] didn’t get the opportunity to look in the window and see the patient because when you do that, you know a lot about what’s going on with the patient and how sick that patient is. When you’re sitting at home, you’re just looking at words,” Gold says. Fore says being remote has not created a barrier to communicating effectively with physicians and that Kaiser Permanente has an excellent response rate. Most physicians respond to queries in a timely manner, providing the necessary information without any additional intervention. “We do have a set escalation process in place that we utilize when needed, and we have dedicated physician champions at each facility to assist us,” she says. Fore sends a text message to physicians in the rare instance when a case warrants a verbal discussion for clarification. “I have them call me at their convenience to discuss any questions they may have about the electronic queries we have placed on the charts” she says. In general, physicians enjoy the remote CDI program at Kaiser Permanente, says Fore, adding that there haven’t been any significant complaints other than those associated with “the usual growing pains of a new program. However, not all physicians are receptive to electronic queries, which certainly poses a barrier for remote CDI, says Mary Mills, RHIT, CCS, president and CEO/consultant at Documentation Solutions, LLC. This sentiment is particularly true for physicians who are on the verge of retirement and are not interested in adapting to EHRs in general. Mills says she has never encountered an entirely remote CDI program. She has, however, seen remote coding programs that operate with an on-site nurse who serves as a liaison with physicians. She imagines that even the most successful remote CDI program would still need to incorporate an on-site specialist to follow up with physicians who are unreachable or who don’t respond appropriately or at all. Before even considering a remote CDI program, hospitals must evaluate what portions, if any, of their record are electronic, says Mills, adding that the majority of hospitals she visits as a consultant are currently in a hybrid stage. At Kaiser Permanente, the record is almost 100% electronic, which enables CDI consultants to easily review information and pose queries, says Callahan. External records, however, pose a challenge because on-site staff must scan the information into the EHR, which delays remote CDI specialists’ access to it in real time, she notes. Training is another consideration. “CDI is typically a new field for people when you’re hiring them,” says Callahan. At Kaiser Permanente, CDI consultants, many of whom previously worked as case managers, RNs, and quality specialists, must meet certain productivity and quality goals during orientation and establish effective working relationships with peers and providers before they are allowed to work from a remote office. Callahan says training these individuals prior to sending them home was one of the most important and challenging aspects of implementing the remote program. One easily overlooked consideration is how to prevent CDI staff from feeling isolated. At Kaiser Permanente, CDI staff meets on site at a regional office for monthly gatherings, and they also use instant messenger to chat with each other throughout the day, says Callahan. Additionally, CDI staff attend monthly face-to-face physician meetings at their assigned facility where they have the opportunity to interact with physicians who can then put a face to a name, says Fore. They also frequently communicate with an on-site physician champion and the providers who receive their queries. Ensuring privacy and security is also an important part of any type of remote program—CDI or otherwise, says Elion. 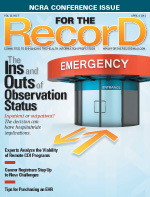 “Given the increasing concerns about patient data safety and the need to avoid having any patient data outside of a controlled environment, remote CDI, if done at all, is more properly done in a controlled environment, such as a site or an office with proper security and confidentiality controls in place,” he says. Perhaps one of the most important considerations when implementing a remote CDI program is evaluating whether physicians and senior leadership will even buy into the concept. “I think you’re more likely to get buy-in if you have all of your plans for your process and your workflow clearly mapped out and documented before you present it. I think if you start it as just a general conversation, people can get scared away from it,” says Callahan. Implementing a quality assurance process can assist with buy-in because it helps ensure the program is moving in the right direction and meeting expected outcomes despite the fact that it’s off site, she adds. Remote CDI programs must incorporate some type of physician education, says Mills. When CDI specialists are off site, hospitals should consider when and how physicians will receive documentation tips and other education normally provided on site. On the bright side, physicians may actually appreciate having the option to read tips and information at their convenience on the intranet rather than attend in-person seminars, she says. Callahan admits that this model may not work for every hospital. “Organizations need to determine how much face time is required for the physicians,” she says. For example, some programs may not be able to function entirely remotely; however, they may thrive when specialists work from home for a portion of the week and on site for the remainder. Understanding physicians’ expectations is also important. In some cases, it may be best to begin the CDI program on site before moving it remotely. In other cases, physicians may support a remote program but insist that CDI specialists be present on site during rounds. “I think there are a lot of different options if you try to be creative with it,” says Callahan. Hospital bed size and patient volume doesn’t necessarily dictate whether a remote program will be successful. “In our own region, we have facilities of various sizes. I think it depends more on your facility and the culture there,” says Callahan. However, he admits that concerns about isolation and communication obstacles as well as the security, confidentiality, and integrity of patient data continue to serve as barriers.